BALTIMORE COMIC-CON: GLASS AND SANTOS GET FURIOUS! Harvey Award winner Bryan J. L. Glass brings his creator-owned superhero to Dark Horse Comics! SEPTEMBER 6, BALTIMORE, MD—Writer Bryan J. L. Glass (Mighty Marvel: Women of Marvel, Thor: First Thunder) and artist Victor Santos (Ghosts, Polar: Came from the Cold, Filthy Rich), two-thirds of the Harvey Award–winning Mice Templar team, will join forces once again for a creator-owned superhero series: Furious! Furious is a five-issue miniseries where celebrity, fame, and superheroes meet. “Furious, the series, is driven by those consequences: An adrenaline-fueled crash into the darkest depths of one woman’s shattered world and what she chooses to do about it!” added Glass. Catch Bryan J. L. Glass at Baltimore Comic-Con on Saturday, September 7, at 12 p.m., for his Powered by Creators panel. Limited prints and postcards will be available. Read an exclusive interview with Bryan J. L. Glass on CBR. 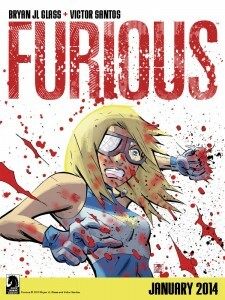 For fans that can’t wait, Furious will be featured in Dark Horse Presents #31 on December 18. Furious #1 (of 5) is in comic shops everywhere on January 29, 2014! This entry was posted in Columns and tagged Bryan J.L. Glass, Came from the Cold, filthy rich, First Thunder, furious, Ghosts, Mighty Marvel, polar, Thor, victor santos, Women of Marvel. Bookmark the permalink. Follow any comments here with the RSS feed for this post. Post a comment or leave a trackback: Trackback URL.